This dog was found 135 miles off the coast of Thailand. But he's not the only adventurous animal - meet the other creatures who've gone on epic journeys. 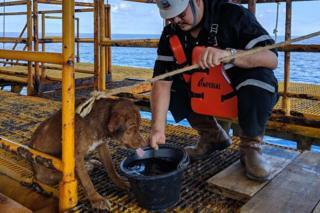 This dog, discovered about 220km (135 miles) off the coast of Thailand, has been rescued by a team of oil rig workers after the exhausted pooch was spotted paddling near a drilling platform. It is not clear how he ended up stranded so far out at sea, but some reports suggest he may have fallen from a fishing trawler. The rig workers named the dog Boonrod, a Thai word that roughly translates as "the saved one" or "survivor". The workers were able to nurse him back to health, before arranging for a tanker to take him back to shore to be checked over by a vet. 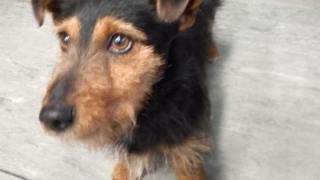 Tyson the dog was found on a train in Ireland. 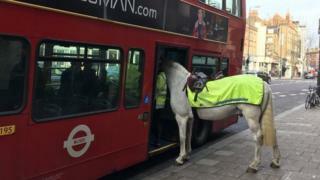 Rail staff looked after him while they tried to track down his owner but as he wasn't micro chipped it was tricky. However with the help of social media and a couple of TV and newspaper appearances, Tyson's owner was found. 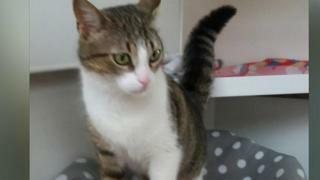 He's going to get micro chipped so if he ever goes on an adventure again, his owner can be traced! Lucy may look like an ordinary cat... but she's really quite a spectacular traveller. What started out as a secret trip in her neighbour's car in Belgium, in Europe, ended up in an epic one year round trip to the UK and back. 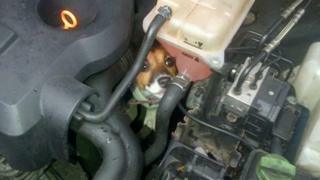 Luckily she was micro chipped so her owners were found and everyone was reunited. 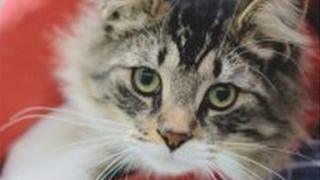 A cat in Canada was reunited with its family after being put in the post by mistake. Baloo appeared to have crawled into a parcel his owner was packing and got stuck inside. The cheeky cat was then sent 750 miles away to another city. After a journey of around 17 hours, a parcel company spotted Baloo and took him to a local animal rescue centre. From there his owners were tracked down and Baloo returned home safe and sound. 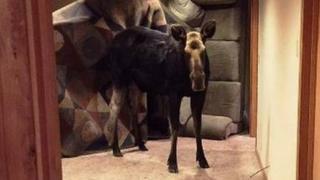 A family in the US got quite a shock when they woke up to find an unexpected visitor in their basement! According to the Idaho Mountain Express, a moose had fallen in through an open window. The woman who owned the house said the moose was very "polite" and caused hardly any damage. 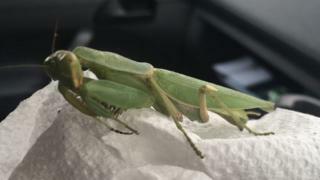 Luckily, the animal wasn't hurt and was released back into the wild. Here is something you have probably never seen before - 80 falcons strapped in, ready for take-off. These feathery fellas are actually owned by a Prince from Saudi Arabia who obviously decided he couldn't travel without them. 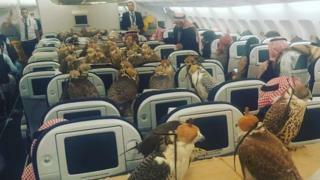 Falconry is extremely popular in Saudi Arabia and lots of airlines in the area actually allow people to bring their birds with them when they travel. 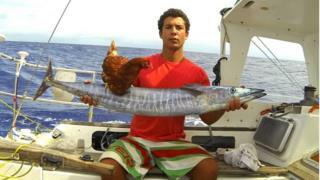 Usually the limit is 6, but we think this Prince may have some friends in high places to get 80 birds on board! Can you spot the odd thing about this photo? Ok, so it isn't that well hidden, but look it's a sailing chicken! This is Guirec - a 24-year-old from France and his friend Monique...who is a chicken. The pair set off on a trip around the world. Guirec said: "The hen was an ideal choice. It doesn't need that much looking after and I'm able to get eggs at sea." Anyone would be shocked to open their car bonnet and see this little face staring back at them but that's exactly what happened when Betty Boop the dog got herself caught inside a car bonnet and taken on a 12-mile journey around Greater Manchester! It was only when a neighbour came home and heard barking that Betty Boop was found. 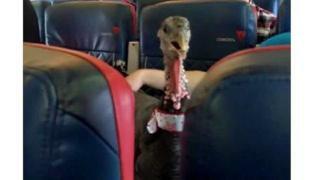 This turkey was snapped on a flight in the US and is thought to be an 'emotional support animal'. This means they are animals that help people to calm down. They are becoming more and more popular. It's thought that for people who are scared of flying, using animals can make the experience much less scary. Dogs catch buses all the time, right? But usually they have their owner with them. Well, Eclipse the Labrador is an independent kind of hound and gets the bus to the dog park on her own! Her owner then meets up with her to go for a nice walk. 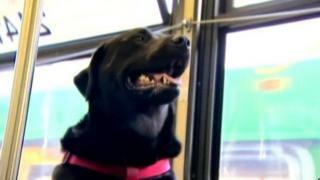 Many residents and bus drivers around Seattle know Eclipse and say that they like seeing her furry face on the buses.